Zeus Hotel rests in a beautiful garden area 20 m off the main road on the outskirts of Kefalos, Kos, just 250 m from a sand and pebble Kamari Bay beach, with the sapphire blue Sea beyond. About 1.5 km from of the centre of the village, this friendly 2 Star hotel is close to all local amenities, bars and restaurants and features 53 comfortable twin and double guestrooms and family rooms perfect for couples, families and small groups of friends. Onsite facilities include a sparkling swimming pool, snack bar, and plenty of warm Greek hospitality! Airport Distance: Kos Airport is 30 km from the hotel. Local Tips: At night don't miss to visit the town centre for all the cultural happenings that occur in the main square as well as the crazy club scene found in the bar street every night until the sun comes up! Dining: The Hotel is booked as Bed and Breakfast accommodation. Zeus Hotel has a snack bar and a Satellite TV lounge in reception. In the evenings, there are plenty of tavernas with choices of Greek and International cuisine just a short walk away. Round off the day with a nightcap at the lively hotel bar. Activities: Swimming pool, sun beds and umbrellas. This 2 Star property is 250 m from the beach with plenty of water sports and activities run by independent operators. Additional: Reception, currency exchange, laundry, ironing, disabled access, Internet service, safe box, parking lot, bus stop close to the hotel where you may catch a bus to Kos town. Family run hotel located in the quiet area of Kefalos resort, 5 minutes walk from the nearest beach. The Zeus Hotel is situated on the outskirts of Kefalos, approx. 250 m away from the sandy beach and about 1,5 km to the resort centre. The hotel is within walking distance to nearby taverns and supermarket. The hotel facilities and services include reception, safe (to rent), satellite TV lounge, bar and pool area with outdoor pool, children´s pool and snack bar with refreshing drinks and during the evening there are plenty of taverns serving Greek and International cuisine. All rooms have A/C (extra charge), safe (to rent), bathroom with shower and hair dryer, iron, balcony or patio. 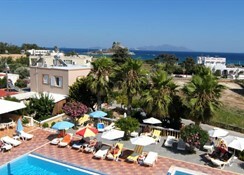 Address: 85301 Kefalos, Kos Island, Dodecanessos Island. Zeus Hotel features 53 double/twin rooms with land views, Superior double/twin rooms, and Superior Family rooms. All rooms have bathroom facilities (shower, WC, hair dryer), twin beds, fridge, air conditioning (extra charge payable locally), safe (extra charge payable locally), Wi-Fi Internet access, and a veranda or balcony. Baby cot is available on request. Having stayed in this hotel the year before I did not hesitate to book again. It is only a three star but is value for the price you pay I can only say one bad thing and that is the breakfast... Tea, Coffee Bread and jam now the reason for this so the bar man and owner told me is this. The travel company's cut is so much if they but on a larger more choice breakfast they would not make a profit. Having said that The Riverside do a full English and it's walking distance from the hotel.